An illuminating, first-of-its-kind resource to help parents foster a love of writing in their child's life. New educational research reveals that writing is as fundamental to a child's development as reading. But though there are books that promote literacy, no book guides parents in helping their child cultivate a love of writing. 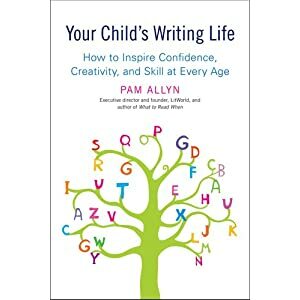 In this book, Pam Allyn, a nationally recognized educator and literacy expert, reminds us that writing is not only a key skill but also an essential part of self-discovery and critical to success later in life. Allyn offers the "the five keys" to help kids WRITE-Word Power, Ritual, Independence, Time, and Environment-along with fun, imaginative prompts to inspire and empower children to put their thoughts on the page. A groundbreaking blueprint for developing every child's abilities, Your Child's Writing Life teaches parents how to give a gift that will last a lifetime. If you are a parent or someone who cares about the future of the children around you then this book is a must read for you. The author has done an amazing job at providing the reader with a treasure trove of resources to help unlock the potential in any child. I loved the fact that the book is set up in such a way that the reader can get ideas for all ages and that the author has even broken down the early years into quantifiable sections with specific things that you can do to work with children of that age. While this book would be great for teachers, I would say that any parent who feels strongly about the literacy and future of your own child should read this and practice the principles within it!